This 35-story tower is one of the most distinctive in the city with its curved corner and continuous bands of balconies in its base. Built by Bernard Spitzer and Melvin Lipman and designed by Wechsler & Schimenti, this beige-brick tower commands spectacular views of Central Park and the curved facade of the 21-story base permits more apartments to have park views. The setback tower, which occupies the top 14 floors is not curved, but has curved corner windows to maximize views. The tower's facade has a horizontal fenestration pattern that continues the banding motif of the base, albeit without balconies. The building was erected in 1963 and converted to a cooperative in 1984. 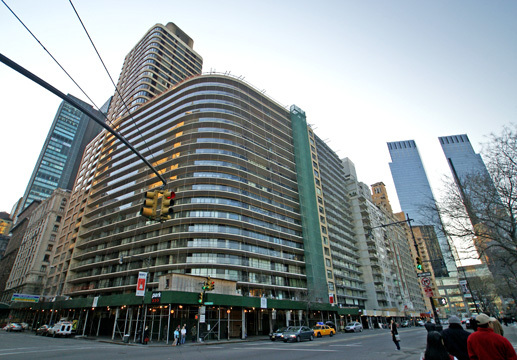 It has 309 apartments and is directly across Seventh Avenue from the very handsome New York Athletic Club. The building's entrance is landscaped and spacious at the busy corner, which is an exit for the Central Park Drive south road. 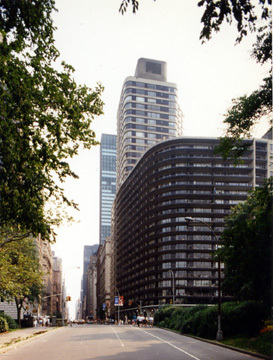 The building's location is convenient both to midtown and the Lincoln Center district and is close to many famous theme restaurants on 57th Street. The building's design was described by Robert A. M. Stern, Thomas Mellins and David Fishman in their book, "New York 1960, Architecture And Urbanism Between The Second World War And The Bicentennial," (The Monacelli Press, 1995), as "a kind of aggressive, self-referential Modernism that had hitherto been largely absent from Manhattan." "To complement the sweeping curve..., a 'plazetta' was created at the corner entrance - essentially a tiny landscaped taxi drop-off of a type virtually unknown in New York apartment house design, where corners had traditionally been filled with solid building. Shocking though the building's shape was, so reminiscent of Morris Lapidus's Fontainebleau Hotel (1954) in Miami, Florida, it had its admirers. In 1979 Paul Goldberger praised its 'swooping curve,' saying it was 'not a bad way at all for a large avenue to meet Central Park.'" Of course, it would help to justify such a comment if both sides of the intersection were similarly treated, which they are not. Although the exterior finish is not magnificent, the building's balconied base is impressive. This building has more of a Miami- or Los Angeles-personality than the run-of-the-mill New York apartment building, but then its location is certainly not run-of-the-mill and the experimentation with form was unusual and something to be applauded in the city when it was erected and it more than four decades later it holds up well. The building has a doorman, a driveway, a large lobby, a garage and many large picture windows, but no health club and no sundeck.